I start with a square of stock and drill a centered hole for the worm screw in the side that will be front of the speaker. After it is mounted a 1/4 inch dovetailed tenon is turned and then it is flipped around a hollowed out. After sanding, the hole is drilled all the way through and then sanded again. Once it is removed, the back 3/8 is sawn off – the back of the phone cradle will form the bottom of the hole. The connecting tunnel from the side of the speaker (next to the cradle) to the speaker bowl is done with a router plane. The only power tools that I use are the lathe and band saw. I will post some more pictures of finished items and shots of the processes as I make more. Please checkout the Etsy site, there I have pictures that I have taken in a light box with my iPhone (I take the pics in the shop with my phone – too dusty in there for the nice camera! ), they give a better sense of scale. Please let me know if you have any questions or recommendations. I am a bit of an audio nut and thought I would comment. I grew up listening to Horn Loaded Speakers. Altec, and Klipsch. The design is much like what you are used to seeing at the local stadium. Probably too difficult to recreate, but they definitely are good at amplifying sound, controlling dispersion, and makeing the most out of sound source. Very efficient. Just an idea if you get bored with the design you have. These are actually easier to make than the others… Just four small pieces stacked and glued with the turned cone out the front. 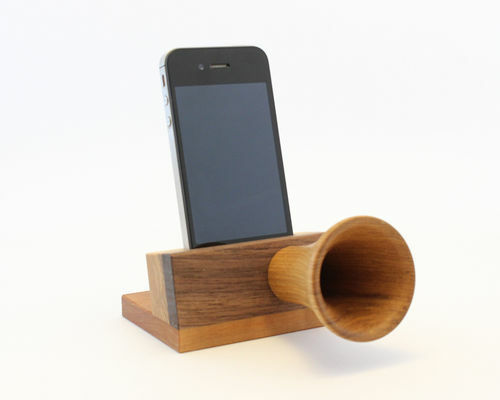 The horn is just below the speaker, it does a really good job! Only works with an iPhone 4, 4S, 5S, or 5C – and no case. Very nice, great design and aesthetically pleasing to boot!